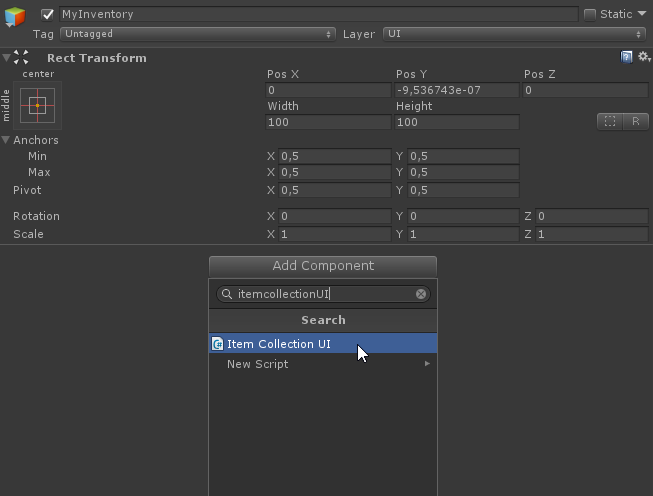 Using the ItemCollectionUI a UI (uGUI) can be defined for a collection. Prefab: The UI prefab used to display a single item. UI Container: The container in which the slots will be stored. Collection Name: The name of the collection that we intend to display here. The collection creator component can create a new collection. 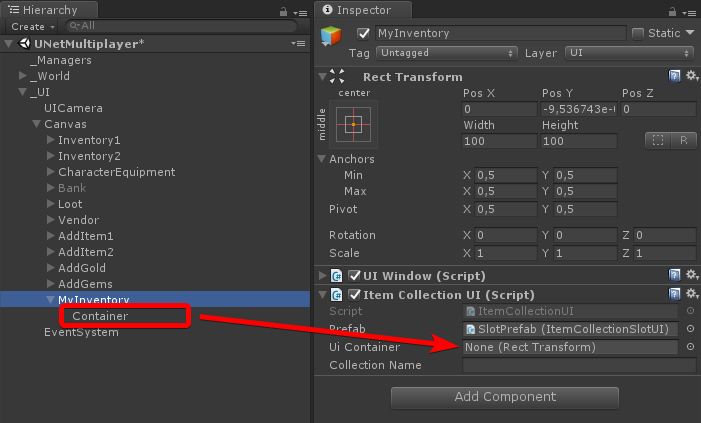 The collection name set in the ItemCollectionUI component has to match the name set in the ItemCollectionCreator component. Create a new empty object inside your canvas and name it "MyInventory". Attach the ItemCollectionUI component. Or see CollectionSlotUI on how to implement your own. Set UI Prefab. This should be a prefab that has the ItemCollectionSlotUI component, or a component inheriting from CollectionSlotUIBase<IItemInstance>. Create a new empty object inside object created at step 1 (MyInventory) and name it "Container". 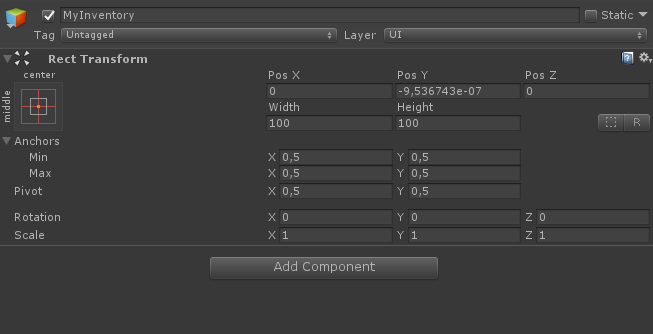 Drag this object into the "UI Container" field. Set the collection name. This has to match the name in your collection creator. A UIWindow component was added when we added the ItemCollectionUI component on step 1. We can add a UIWindowInputHandler component to show / hide the window when a key is pressed. The CollectionUIBase<T> class is a useful helper class that you can use to implement a custom collection UI. You're not required to use this base class. Slots represent a single item and all of it's information in the collection. See Slot UI for more details. The UIQueuedMonoBehaviour<T> is a base class that queue's up changes and repaints everything at once when the UI becomes visible. If the UI is already visible at the time of the change a repaint will occur instantly. Elements that are affected multiple times will only be queued once, and thus, will only repaint once. // Do something to newly created UI slot instance. // Note that you can also handle the repaint in a custom slot class.